Zip lining. 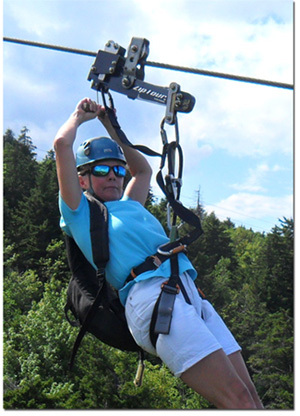 What an awesome thrill ride you can experience as part of the adventure play area at Gunstock. Did you ever stand up through a car's sunroof going down the highway at high speeds? Probably not. If you could imagine what that's like, then you can imagine the freedom you feel while gliding down Gunstock Mountain. We had cousins try out the zip lines on a foggy day and they had loads of fun. That sparked a desire to try it myself. So, my daughter and I made the trek to Gunstock Mountain and got outfitted with all the rigging to make sure we were safe. The larger people (the cut off is around 120 lbs.- so its not really larger) wear harnesses that fit over your shoulders. 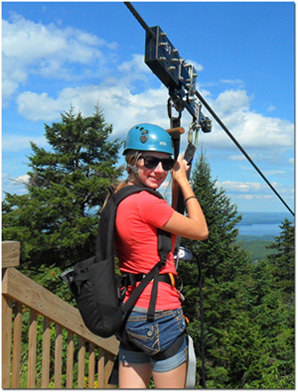 Gunstock's zip lining tour travels over 1 1/2 miles from peak to peak. You can travel up to 55 mph, maybe even faster. But, don't worry. The lighter people such as kids won't go that fast. 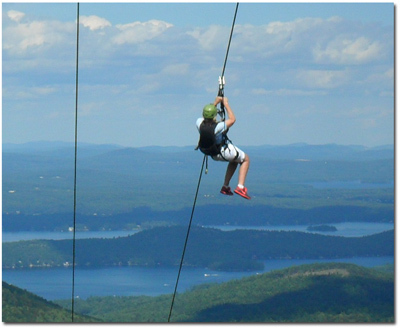 The whole experience of of the zip tour at Gunstock takes about two or so hours to complete. If you come first thing in the morning, it won't take as long. They run these tours in the rain, fog, snow and of course, good weather also. Once you have your harness and helmet all set, you get a backpack that holds your ZipTour Trolley. That thing is heavy. This is where it pays off to exercise regularly to make yourself stronger. You get to test your skill on their mini course to get the feel for it. When you've completed that little task, you move up to the big mountain. This is where you get to ride up the chairlift. When you ride up the chairlift you have to move your backpack to the side so you can ride comfortably. But, you have to be careful that the ZipTour Trolley doesn't fall out. If so, then you have to wait for a new one to be brought to you. You also don't want to drop them because they cost $3000 each. 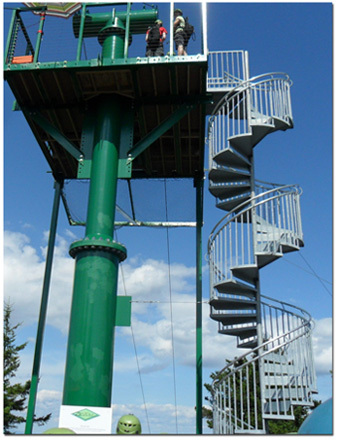 Once at the top, you climb the tower to reach the zip lines at the Summit. I think the scariest part is going up those spiral staircases. They move a bit as you're walking, even though guidelines hold them in place. It's quite a workout by the time you get to the top. But, the views and ride down are worth it. They only let two people at a time go. As the two people before you zip down, the guides (people that work there) set you up and get you ready for your turn. At the same time two more people are up there waiting their turn. This stretch of the tour goes from the Summit over to the top of Pistol area. The views are magnificent. You can see almost the entire Lake Winnipesaukee. Its blue waters with the backdrop of green trees is a drastic difference to the snow and bare trees in the winter. Gliding through the air from the Summit area to the top of Pistol which is over 3/4 of a mile long is the start of your thrill ride. Once there, the guides help you disengage from the cable and send you on your way. Then you trek up to a new platform with another spiral staircase. Its the same process all over again. Where the guides set you up to make the final ride from Pistol to the Aerial Treetop course at the bottom. This zip line is over 3800 feet long. They tell you when to start braking so that you glide in and stop smoothly. At this second tower, many of the visitors started creating rock towers. There are quite a few of these. Maybe they were standing in line and got bored. Not sure, because there wasn't a line at this tower when we went. Most people glide down without stopping. But, my daughter and I decided to stop and take a picture, then we went on our way. Apparently, this confused the guides at the bottom because most people never do this. Taking pictures isn't that easy when you're the one riding the zip lines. The guides at the towers take pictures of you for purchase later. You can also rent a special camera that straps onto your helmet. That way your hands are free to hold on. When our zip tour was done, we walked down the platform. Thankfully, it wasn't a spiral staircase! There's a little golf cart at the bottom to put your gear in so you don't have to lug it back. Apparently, before they thought of the golf cart, you would have to carry your gear back. That was a brilliant idea. Plus, it makes your experience that much better by not having to do the extra work. The price of the zip line isn't cheap, but it sure is an adventure that you should try when you're visiting the Lake Winnipesaukee area of New Hampshire.